The Hillsdale kids and teen Kensington 7 drawer dresser is a balance of functionality and elegance. 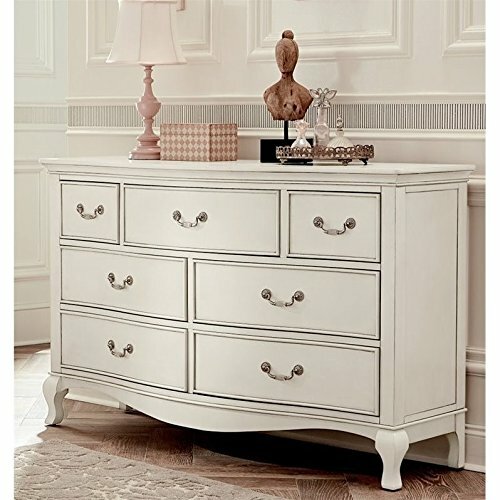 This sweetly sophisticated collection is full of timeless curves and simple beauty finished in a beautiful Antique White finish. Featuring bowed fronts, simple curved lines, pewter and crystal bail hardware the elegance and simple beauty are a perfect compliment to the decorative queen Anne leg. Assembly required. If you have any questions about this product by Hillsdale Kids and Teens, contact us by completing and submitting the form below. If you are looking for a specif part number, please include it with your message.